Reserve Bank Governor Graeme Wheeler appears to be one who can get over jet-lag in a few days, and he seems to be sleeping a little better at night with all those global-risk nightmares becoming less frequent. But that doesn’t mean central bankers aren’t concerned about the global growth outlook, with uncertainties stemming from potential US policy settings still front-and-centre of the risks offshore that could affect New Zealand. Wheeler told media on Thursday that he had just returned from a Bank for International Settlements meeting in Tokyo earlier this week, where the outlook for the global economy was discussed. There remains a lot of concern being expressed about the new US administration’s policies, or potential policies, with uncertainties around how far the US will go regarding trade protectionism and whether a huge suite of proposed tax cuts will get through Congress. US President Trump’s recent comments on Canadian lumber tariffs and on the North Atlantic Free Trade Agreement (NAFTA), as well as guessing how the US/China relationship will develop under the new regime were mentioned. Strong growth in China at just under 7% per annum, and better news out of Japan, East Asia and Latin America was helping, Wheeler said. All up, the global economy appears set for output growth of about 3.5% this year, which is about the same as the average over the last couple of decades, he said. However, Wheeler did mention that this was being supported by accommodative monetary policy around the world. Asked whether monetary policy looks set to become less accommodative in the future, Wheeler wouldn’t be drawn on specific talks between global central bankers at the meeting. But he did cite a number of public comments made recently by his global counterparts. The US Fed looks set to tighten twice more this year, Wheeler mentioned. He later said that the Federal Reserve believes the US economy is at, or close to, full employment, leading to questions about what sort of fiscal adjustments there will be from the Trump administration on tax cuts and/or infrastructure spending. Both could add to US activity. Meanwhile, Wheeler noted comments from the European Central Bank’s President that the ECB will continue its quantitative easing policy at about 60bn Euros per month through the rest of the year, and developments in Japan targeting its ten-year bond yield. These indicated both the ECB and BoJ weren’t looking to tighten at this point in time, he said. One concern out of China that Wheeler did refer to was the build-up in debt there, with the PBOC having recently tightened policy. 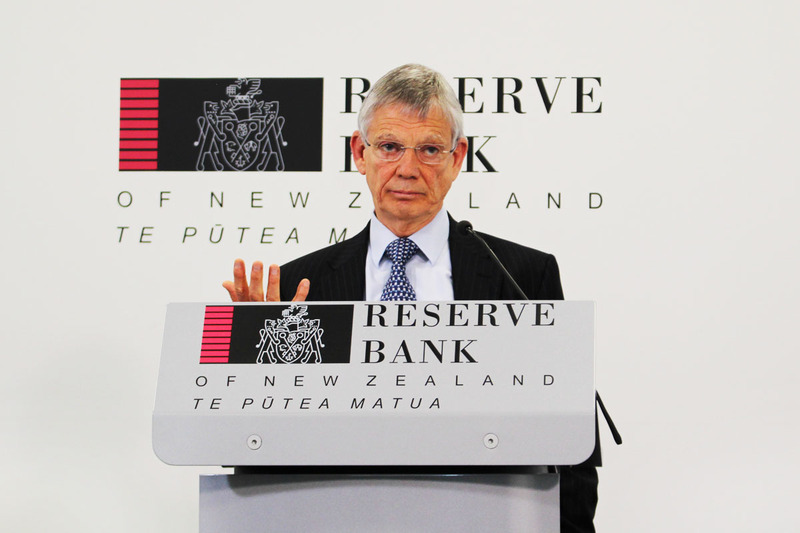 In all, the economic outlook for New Zealand’s trading partners has improved since February, the Reserve Bank said in Thursday’s May Monetary Policy Statement. However, risks remain skewed to the downside. “Key downside risks include the possibility of a global shift to more inward-looking and protectionist trade policies, and a more pronounced slowdown in China. While risks around the outcomes of some European elections have eased, geopolitical tensions have increased in the Middle East and around North Korea,” the Bank said. “While risks remain skewed to the downside, some upside risks have become more apparent over 2017. Economic survey data – such as consumer and business confidence – have risen strongly, exceeding economists’ expectations during early 2017 across a number of countries, most notably for the United States. as the article states "The whole OBR concept is fundamentally flawed and grossly unfair to depositors." The RBNZ with its extremely light regulation must be looked on with delight by the Australian parent banks who will benefit the most from NZ depositors whether it is the NZ banking subsidiaries in trouble or the Australian parent banks themselves. It will be NZ depositors penalized and losing their money directly to ensure the banks themselves can continue to prosper.. Australian depositors are well protected and you can be sure the Australian banks will shift no money to NZ to prop us a failing bank here. It is a one way street. And what happens without the OBR? The bank still goes down, taking the depositors saving with it ( they would stand in line as an unsecured creditor in any wash-up). All the OBR does is attempt to get the bank opened up to resolve the matter. The outcome could very well be the same, but at least the OBR specifies a means of management of the situation. and also means there is the opportunity for the tax payer to stand aside and not shoulder the losses. Aren't NZ depositors supposed to have their NZ domiciled savings in Aussie-based banks ring-fenced in the event of an Aussie banking failure? and the alternative would be grossly unfair to the tax payer. Its simple really invest wisely and dont expect a bailout by someone else. You mean don't keep money in the bank, buy houses instead?? What I expect, not unreasonably, is that the Govt encourage banks to greatly reduce depositor risk by reducing their massive leverage; greatly improving capital ratios. Is it not a little strange that almost every other country( 113 in 2014) has decided that some level of depositor protection is justified? Let me quote the IMF; "The introduction of a deposit insurance framework is the first-best element to complete the financial safety net". How about a quote from Professor Mayes,formerly chief manager and chief economist at the RB; "having OBR without depositor insurance is incredible". You write that it's simple really invest wisely. Do you mean that depositors should attempt to evaluate the strength of our banks before deciding where to invest? If so,that's nonsense. Even the RB itself recognises that most people cannot do that and is working on a 'dashboard' to provide depositors with more and clearer information. I agree that we should have some level of deposit guarantee and I think we will adopt the IMF's recommendation of a de minimus level at say $10,000. Should one of the Australian parent banks collapse,the assets of its NZ subsidiary would be ring-fenced and i have that in writing from the RB. Bank for International Settlements. For, not of. So what has Graham done since September 2012, followed the misguided Riksbank as the only notable central bank and started raising interest rates in Feb 2014, inflation was running at around 1.5 percent,raised them 4 times and got the central bank of the year award. Made the argument that the RBNZ could sell NZD to lower the exchange rate Got the award, started dropping the OCR in May 15, 7 times, now inflation is 2.1 percent, but that will pass thru the snake.Got nothing to do with the weakening exchange rate, and the shell game of exchange rates and house prices. Came to the post concerned about Auckland house prices , median has risen from 505000 to 890000. Chump change. Four and a bit years. How long did it take to see prices rise 385000 previously. If he was worried previously what is he now , contented. 60 Billion more in mortgage debt , wander why interest rates can never rise until they do .Until interest rates rise the wealth gap will continue to widen , the middle class will be gradually denuded , and there will be continued speculation in certain asset classes. Borrow and spend until the reset. The Riksbank , the first central bank to raise rates post GFC, surprised the markets in April, maintaining its -0.5 rates,continued bond buying and pushed raising rates out further until 2019, and they also have a real estate bubble. I agree the threat of rising interest rates is an empty one, at least until some sort of global currency reset. Similarly, the threat of the OBR is an empty one. If push comes to shove the government would come to some bail out arrangement (as they always have done). The reality of the OBR would be too horrific, & catastrophically deflationary to contemplate. I would say the nightmares are relentless, not less frequent. Wheeler is no fool. He will realize that he cannot predict the outcome or even present the scenarios in public. When governments bailed out the banks in 2008, that set the precedent. So what controls reckless lending by banks, with a "we're too big too be allowed to fail" attitude?